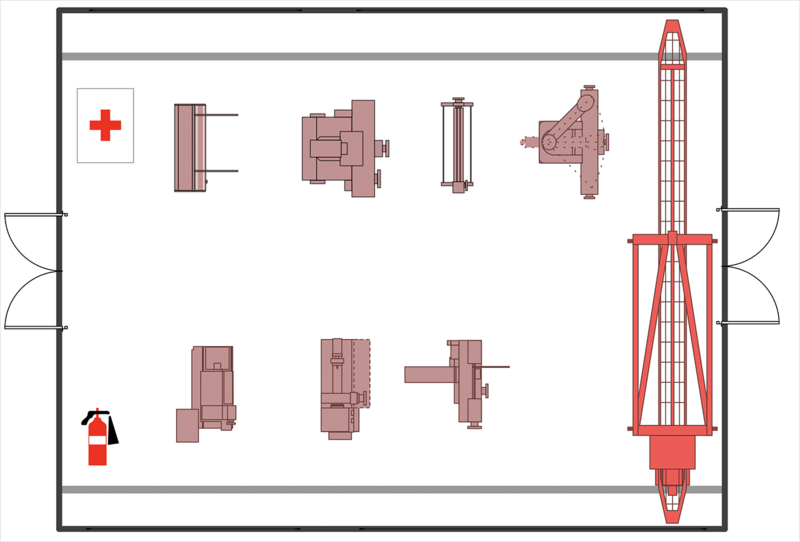 Plant layout is a floor plan for designing and arranging the certain machinery and equipment of an enterprise. It is used to determine the best places for equipment installation to permit the quickest flow of raw material, at the minimum cost from the receipt of raw material to the shipment of finished product. It is designing the right facilities, together with the right place, to manufacture a product in the most effective manner, through the smallest possible distance and in the economic possible time. Plant layouts both existing or planning are aimed to get bigger efficiency of interaction between equipment, materials, technologies, and staff in a plant. Making a plan that shows the location of industrial equipment involves many different elements that can be managed using ConceptDraw DIAGRAM The ability to create plant design solutions is delivered by the Plant Layout Plans solution. This solution supplied with three libraries that contain more than 60 vector stencils for plant design. The Plant Layout libraries that contain in the solution provide objects you need to create a detailed manufacturing plant layout, containing the buildings, storage, machinery, and shipping equipment. With ConceptDraw DIAGRAM you can easily create and communicate the layout plan for your enterprise. Run ConceptDraw DIAGRAM and open a new document page. Select libraries from the Plant Layout Plans section on the Libraries panel. Select further libraries from Building Plans section to show floor plan elements: walls, doors, windows etc. Now you have a work-space and a set of corresponding libraries. Set the measurement units and the scale for our floor plan using Document Properties dialog. To align objects horizontally or vertically, and to distribute them at regular intervals, select the objects, and then, use options from the Align and Distribute section of the Arrange&Size panel. Result: With ConceptDraw DIAGRAM you can easily create and communicate the layout plan for your enterprise.